Name it Labels personalised water bottles make a truly unique and practical gift. Ideal for children and adults. Suitable for school, home or in the office. Say goodbye once and for all to plastic drink bottles. Do your bit for the environment. With more than 15 designs to choose from and many coming in a range of colour options, you really will be getting a bespoke drink bottle. Our personalised water bottles have a 600ml capacity are made from 100% aluminium, making them robust and long lasting. Personalised water bottles are usually dispatched within 5 – 7 days. Many of our designs are also available in our lunch bag range and boot bag range so you choose matching designs. Or if you child does many activities you may wish to choose a different design for each activity. 100% BPA free to ensure drinks stay fresh all day long. The 600 ml capacity is a great size, whilst not being too heavy for kids. 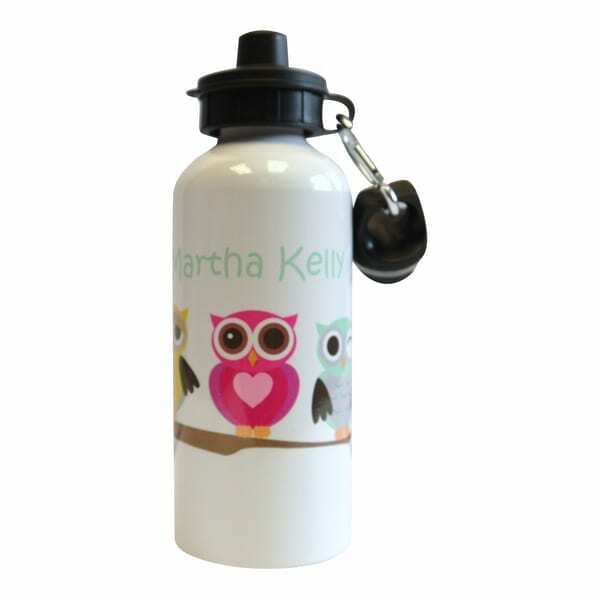 A personalised water bottle makes a lovely gift for a child starting school, or for Christmas or Birthdays.